Pakistan's consumption of oil and gas has rapidly grown over the last 5 years, an indication of the nation's accelerating economic growth. Pakistan is among the fastest growing LNG markets, according to Shell 2017 LNG report. 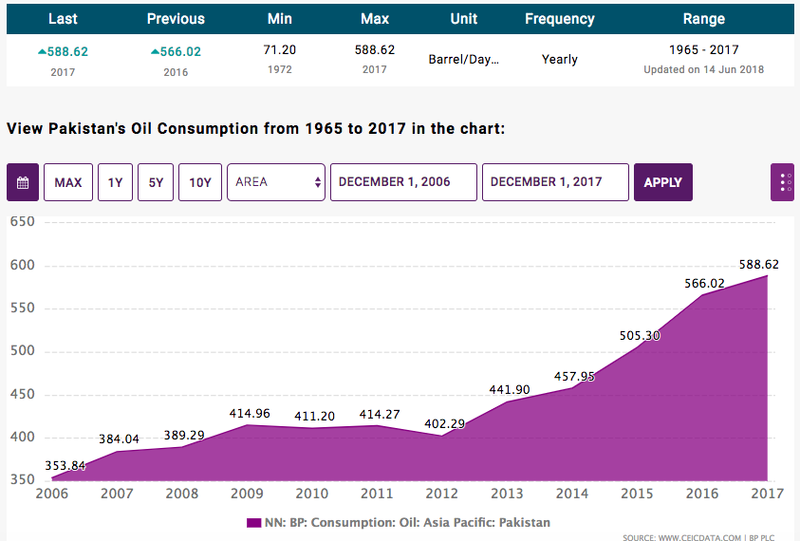 Oil consumption in Pakistan has shot up about 50% from 400,000 barrels per day in 2012 to nearly 600,000 barrels per day in 2017. During the same period, Pakistan's gas consumption has risen from 3.5 billion cubic feet per day to nearly 4 billion cubic feet per day, according to British Petroleum data. Pakistan is among the fastest growing LNG markets, according to Shell 2017 LNG report. The country has suffered a crippling energy shortage in recent years as demand has risen sharply to over 6 billion cubic feet per day, far outstripping the domestic production of about 4 billion cubic feet per day. 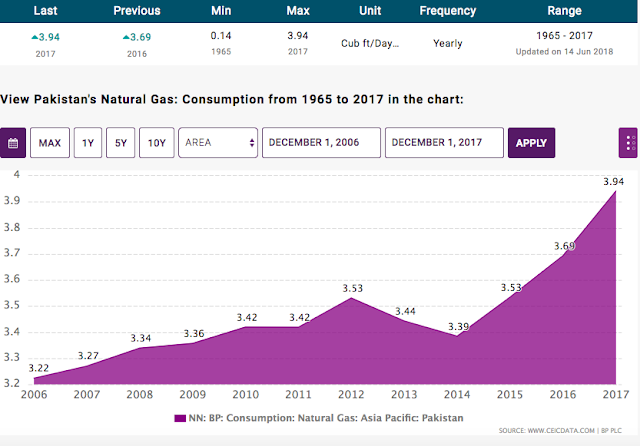 Recent LNG imports are beginning to make a dent in Pakistan's ongoing energy crisis and helping to boost economic growth. Current global oversupply and low LNG prices are helping customers get better terms on contracts. Since the middle of the 18th century, the Industrial Revolution has transformed the world. Energy has become the life-blood of modern economies. Energy-hungry machines are now doing more and more of the work at much higher levels of productivity than humans and animals who did it in pre-industrial era. Every modern, industrial society in history has gone through a 20-year period where there were extremely large investments in the energy sector, and availability of ample electricity made the transition from a privilege of an urban elite to something every family would have. It seems that Pakistan is beginning to recognize it. If Pakistan wishes to join the industrialized world, it will have to continue to do this by having a comprehensive energy policy and making large investments in the power sector. Failure to do so would condemn Pakistanis to a life of poverty and backwardness. Pakistan is heavily dependent on energy imports to drive its economy. These energy imports put severe strain on the country's balance of payments and forces it to repeatedly seek IMF bailouts. Pakistan needs to develop export orientation for its economy and invest more in its export-oriented industries to earn the hard currencies it needs for essential imports including oil and gas. At the same time, Pakistan is stepping up its domestic oil and gas exploration efforts. American energy giant Exxon-Mobil has joined the offshore oil and gas exploration efforts started by Oil and Gas Development Corporation (OGDC), Pakistan Petroleum Limited (PPL) and Italian energy giant ENI. Why Blackouts and Bailouts in Energy-Rich Pakistan? Did not know this but Pakistan's gas consumption per capita is 5 times as much as India's. That is staggering difference. Indus: "Did not know this but Pakistan's gas consumption per capita is 5 times as much as India's. That is staggering difference." in Pakistan was mere 0.02 Ton of Oil equivalent (TOE) in 1947. Total Energy Consumption Per Capita from 2003 to 2013 gives us a better perspective. Per Capita total energy consumption went down in Pakistan! Pakistan is on the cusp of something large. It is evident in every corner of our towns. We have to control the religious thugs for a few years. Anonymous: "--- We have to control the religious thugs for a few years. And the non-religious ones too! Early signs of economy are clear. Pakistan has turned the corner. Energy consumption is one good indicator. Other consumer consumption is booming. Saudi and Chinese funding is secured. IMF went back empty handed and Trump has been shown his place. The Indian government has not yet disclosed the price tag for making this significant switch away from crude and toward natural gas. That being said, analysts have consistently said that using natural gas as fuel for vehicles and households alike is markedly less expensive than LPG, and considerably cleaner than petrol or diesel, a majorly important factor in the smog-choked country with an exponentially expanding middle class. As more people with buying power enter the market with the desire and the means to buy vehicles and power their homes, the importance of clean energy only becomes more dire. Global independent tank storage company Vopak said on Tuesday it will increase its stake in liquefied natural gas (LNG) infrastructure in Pakistan, as the South Asian country turns to LNG imports to curb energy shortages. Vopak said it will acquire a 44 percent stake in total in Elengy Terminal Pakistan Ltd, whose subsidiary owns the South Asian nation's first liquefied natural gas (LNG) import facility. The acquisition will involve separate transactions with International Finance Corp (IFC) and Engro Corp and includes a 29 percent stake the company said it would buy in July, Vopak said in a statement. The purchase is subject to conditions including regulatory and shareholder approvals, and is expected to close in the first quarter of next year, it said. Elengy Terminal Pakistan's subsidiary Engro Elengy Terminal owns an LNG facility which is located at Port Qasim in Pakistan, adjacent to the Engro Vopak chemical terminal. The facility has been in operation since 2015 and is the first LNG import facility in Pakistan. "Pakistan is a market with more than 200 million people and has a growing energy demand in which the share of gas is expected to increase," Vopak said. "Gas is mainly used for power supply for the growing population, industrial usage and as feedstock for fertilizers." Once the transaction is completed, Elengy Terminal Pakistan's shareholders will be Engro and Vopak. Out of the 21 energy projects to be completed on a fast track (by 2019) with a cumulative capacity of 10,400 MW, nine are coal power plants, seven wind power plants, three hydropower, and two are HVDC transmission line projects. Nearly USD 35 billion of the USD 60 billion worth of loans for producing energy from the China Pakistan Economic Corridor (CPEC) will be used to build new power stations, mainly coal-fired. The projects completed include two mega coal power plants of 1,320 MW each, one in Punjab’s Sahiwal (commercially operating since May 2017) and the other in Karachi’s Port Qasim (Commercially operating since April 2018) using imported bituminous coal with modern supercritical coal-fired units. According to news reports, the country’s National Accountability Bureau has initiated an alleged corruption probe into both the costly projects. Another one under completion is in the Thar desert in Sindh, about 400 kilometres from the port city of Karachi. It includes mining and setting up two 330 MW power plants at a cost of USD 2 billion. Once completed, it will be the first large power generation project using local coal. The Sindh Engro Coal Mining Company has finally reached the coal seam in the desert. According to the company’s chief executive officer, Shamsuddin Shaikh, by October the company would have dug down to 162 metres to be able to dig up “useful” lignite coal. At the same time work at the first of the two power plants is 85 per cent complete and commissioning will begin by November-December this year when it will start supplying power to the national grid on an experimental basis. Once the first plant is fired, it will gobble up 3.8 million tons of coal each year. Other projects in the pipeline include three 1,320 MW coal power plants. The ones at Rahim Yar Khan (in Punjab), and Hub (in Balochistan) to be completed between December 2018 and August 2019 respectively, will use imported coal. The third one, at Thar Block VI (in Sindh), will use indigenous lignite coal. That does not mean that Pakistan is going to be completely coal-driven. Vaqar Zakaria, managing director of environmental consultancy firm Hagler Bailly Pakistan, put the figure to “just about 10 per cent of current power generation” which is from imported coal. However, he pointed out that coal-based power generation will increase to about 30 per cent of the country’s capacity requirement in the next three years once plants on Thar coal come online, and those at Hub and Jamshoro expand on imported coal. Zakaria pointed out that the main argument in favour of Thar coal was the “lower reliance on imported fuel”, and to meet the “demand particularly when hydropower drops in winter” although the capital cost was high as the mines also have to be developed. However, he predicted the country will “see a slowdown in capacity addition in Thar in future”. But projects relying on imported coal were questionable, especially those that are being carried out now, said Zakaria. “The earlier ones were justified [by the government] on the basis of load shedding and early induction of power to fill the demand-supply gap like the one at Port Qasim and Sahiwal plants that are already online; but the ones at Hub and Jamshoro cannot be justified on that basis. It is hard to understand why a project on imported coal was added so late in the game,” he said. Pakistan Council of Renewable Energy Technologies (PCRET), which is working under Ministry of Science and Technology, has installed 562 micro-hydel power plants with total capacity of 9.7 MW during the last five years, electrifying more than 80,000 houses. An official source from Ministry of Science and Technology told APP that the ministry and its research and development organizations are mandated to develop technologies for socio-economic development of the country. Technologies have been developed in different sectors like water, renewable energy, electronics, health, Small and Medium sized Enterprises (SMEs), industry, agriculture etc to directly and indirectly benefit a common man. Listing different technologies developed during the last five years, the official source informed that PCRET has installed 155 small wind turbines in Sindh and Balochistan electrifying 1560 houses and installed 4016 biogas plants. The council has established 20 KW hybrid system including solar, MHP and wind in collaboration with China for research and training purposes. PCRET has also designed and stimulated Wind Turbine and solar products including Solar Cooker, Solar Dryer, Solar Water Heater and Solar Desalination. During the last five years, Pakistan Council of Scientific and Industrial Research (PCSIR) which is also an important department of the ministry has developed Coal Water Slurry Fuel and Reinforced Derived Fuel and solar driven one inch and two inches water pumps. PCSIR has also designed the Solar Powered Reverse Osmosis Plant, the source said. While National Institute of Electronics (NIE) has developed LED lights, Solar Charge Controller, Automatic Voltage Stabilizer and cascaded multilevel inverter based transformer-less Unified Power Flow Controller, it added. Saudi Arabia plans to set up a $10 billion oil refinery in Pakistan's deepwater port of Gwadar, the Saudi energy minister said on Saturday, speaking at the Indian Ocean port that is being developed with the help of China. "Saudi Arabia wants to make Pakistan's economic development stable throughestablishing an oil refinery and partnership with Pakistan in the China Pakistan Economic Corridor," Saudi Energy Khalid al-Falih told reporters in Gwadar. It said Falih would finalise arrangements ahead of signing memorandums of understanding. Wood Mackenzie expects mergers and acquisition spending in the region to total about $8 billion in 2019 after growing 60 percent to $8.7 billion 2018. Activity will be focused around divestments in Southeast Asia by companies that want to focus spending on U.S. shale. A group including Eni SpA and Exxon Mobil Corp. will start drilling the Kekra-1 well this month in deepwater south of Pakistan. The country’s onshore natural gas production has been declining after years of under-investment, leading to the start of liquefied natural gas imports in recent years. Growing demand for the fuel has made the drillers more confident that they’ll be able to sell any gas from a sizable development, Harwood said. What Happened: ExxonMobil has begun drilling for oil and gas 143 miles off the coast of Karachi in the Arabian Sea, Daily Pakistan reported Jan. 10. Why It Matters: The operations mark the first time an energy company is conducting offshore exploration along Pakistan's coast. An ExxonMobil executive has said the company has been considering launching operations in the region because of Pakistan's growing energy demand. Background: Only 15 percent of Pakistan's energy consumption is met by domestic production. High energy prices have significantly inflated the country's import bill and contributed to draining its foreign exchange reserves. Ghulam Sarwar Khan, Federal Minister for Petroleum met Mr. Irtiza Syed, CEO, EXXON Mobil on Wednesday at his office. Will rising demand, new exploration activity and a refresh of government policy bring renewed confidence in Asia-Pacific’s upstream industry in 2019? Wood Mackenzie’s research director Andrew Harwood shares his thoughts. The need to fill new and old gas infrastructure will see the drilling of exciting offshore prospects across Australia, Brunei, Malaysia,Myanmar, Pakistan and Papua New Guinea. Some will be frontier deepwater exploration. But access to gas demand centres will be the primary driver of which prospects make the grade. • Offshore Pakistan, ExxonMobil and Eni will spud the ultra-deepwater Kekra-1 well in early 2019, targeting a carbonate play that could be a game-changer for the country’s burgeoning gas market. • Repsol’s Rencong-1X well, offshore North Sumatra, Indonesia, is generating strong interest from potential farm-in partners. We expect a deal to be done before the well spuds in Q3 2019. • In Papua New Guinea, Total’s Mailu-1 well is targeting a giant oil prospect in over 2000 metres of water, potentially opening a new ultra-deep offshore play in the Papuan Basin. From a licensing perspective, several countries are set to launch new bid rounds in 2019. But only those offering a fair balance of risk and reward will be successful in attracting new investment. Despite recent fiscal revisions in India and Indonesia, we expect lacklustre interest in their latest acreage offerings, and investor appetite is likely to be limited for other 2019 licensing opportunities in the Philippines, Bangladesh and Myanmar. M&A spend grew over 60% to US$8.7 billion in 2018 compared to 2017. We expect 2019 to be flat with around US$8 billion of potential deals in the pipeline. We expect to see divestments in Southeast Asia by primarily US-focused players, such as Hess, ConocoPhillips and Chevron, seeking to redeploy capital towards lower-cost, higher-return opportunities elsewhere. With a steady supply of international oil companies (IOC) assets potentially becoming available, and the region’s national oil companies (NOCs) on the hunt for new partners to share financial and technical commitments, there should be no shortage of acquisition opportunities in 2019. Deal activity in Australia is also likely to continue at a brisk pace, as LNG operators position themselves for the next wave of investment, and local producers look to take advantage of a tightening domestic gas market. Join the Asia Pacific oil and gas research team as they gaze into their crystal ball and run down some of their top themes and events to look for in 2019. Contrary to global trends, 2019 looks a relatively low-key year for new project sanctions in Asia-Pacific. PetroVietnam’s Block B gas development and ConocoPhillips’s Barossa are the largest projects targeting FID over the next 12 months, but both are in danger of being pushed into 2020. As attention in Australia’s LNG sector turns towards backfilling the existing Pluto and North West Shelf infrastructure, collaboration among operators is becoming a genuine option. Woodside’s Scarborough and Browse are the most likely medium-term candidates to provide new feedgas. But Chevron’s Clio-Acme development may leapfrog both with a surprise 2019 FID if commercial arrangements for third-party access to LNG infrastructure can be finalised. If so, it would be quite a turnaround for an industry not known for playing together in the past. The Middle East was a bright spot for global liquefied natural gas demand in 2015. Now imports have plummeted so much that it could take a decade to recover. Last year’s 37 percent slump and the prolonged negative outlook is in contrast to the region’s two-year LNG demand surge that outpaced global growth, according to BloombergNEF and ship-broker Poten & Partners Inc. data. The Middle East is now expected to make up less than 4 percent of global imports for at least eight years. There are only five importers -- Egypt, Kuwait, Jordan, the United Arab Emirates and Israel -- of LNG in the Middle East. Bahrain is expected to join the group this year. Why are LNG imports falling? Which countries are leading the decline? Egypt, the region’s biggest LNG importer in 2016 and 2017, will halt purchases this year and may resume exports thanks to surging domestic supplies from the giant Zohr field. Jordan will rely more on pipeline imports from Egypt, trimming its need for LNG. Bahrain, the only country that will add import capabilities in 2019, isn’t expected to reach meaningful volumes until 2022, according to BNEF forecasts. What does this mean for Qatari exports? Qatar, the world’s biggest LNG exporter, has boosted its position in the Middle East’s shrinking market since 2016. The exit of Egypt from the scene will likely erode that status. Almost half of Egypt’s imports came from Qatar last year. Still, the region isn’t a major market for Qatar and growth in Asia will more than offset declines in the Middle East. How will this impact global markets? Imports of LNG in the Middle East are dwarfed by Asia. Supply of the fuel -- driven by the U.S., Qatar and Australia -- is expected to rise almost 18 percent by 2030, and demand will grow more than double that rate. Even Kuwait, the region’s biggest importer, barely registers in global terms. Its imports are even less than the smaller markets in Asia such as Thailand, Bangladesh and Pakistan.